The Paiste Twin Stand is also known as The Paiste Square Orchestra Set Stand. All Stands come with Free UK Delivery. Description: This stand fits two gongs and comes with four high-quality rollers. The stand legs are adjustable in height for players to easily reach the gong in all playing situations. 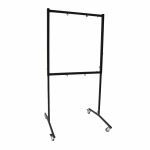 Orchestra Square Set Stands also known as Paiste Twin Stands are available in a black finish.